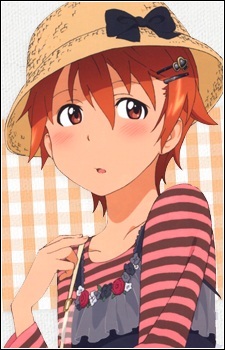 Inami is a timid, 17-year-old girl who joins the rest of the employees at Wagnaria. She has androphobia and is thus terrified of men; she punches any male that comes near her. This violent behavior arises from her belief that every man is ready to attack her, but instead she is prone to violently attacking men at a moment's notice due to this fear. This androphobia was caused by her father who did not want her to eventually wed due to jealousy and thus told her that males would attack her, which ended in her fearing men since then. As she and Souta usually share shifts, he takes the brunt of her attacks. However, she makes considerable progress with her fear of men by taking it out on Souta; she states that she is able to be about two meters close to guys without having the urge to hit them. Though this extends to only having fairly civil conversations (often ruined by Souta's rudeness) or if Inami launches an attack on him. She wears a hairpin in her hair, which she changes every day due to Souta's compliment on it (according to Souma). At first she begins to develop a crush, but later she falls in love with Souta when he confronts her father (as Kotori) about her androphobia. She eventually overcomes her androphobia and at the end of the series Souta confesses to her, after which they become a couple.